Food trucks are really nothing new in the United States. The concept of buying lunch from a street vendor in a cart or other vehicle has been around for decades, but they’ve usually been seen as a cheaper alternative for those who don’t want to pay for a meal at a sit-down restaurant. However, these cheaper alternatives have absolutely exploded in popularity over the last couple of years, so much so that local food trucks have become trendy places to eat in some places. Food trucks are red-hot right now, but why is that? What is it about these trucks that have attracted so much attention from diners and entrepreneurs? It could be a combination of several factors. According to a study conducted by Emergent Research, the food truck industry could stand to generate $2.7 billion in revenue by the year 2017. Also, the food offered by these trucks is fairly inexpensive compared to what is offered at most restaurants. According to a data from the same study mentioned above, most food truck customers spend an average of $9.80 for lunch at their favorite trucks and $14.99 for dinner. The vast majority of these customers were very satisfied with the quality and convenience of their food, and many said that they would continue to patronize food trucks. As much as customers love eating at food trucks, entrepreneurs love them as well. Food trucks are essentially just mobile restaurants, except they represent a much smaller investment and price tag. Operating a restaurant is expensive, with owners often spending over $500,000 just to get their new business venture off the ground. This includes things such as insurance, advertising, equipment, improvements to a property and everything else that goes into opening a sit-down restaurant. On the other hand, a successful food truck can be started for a little over $90,000. This includes the price for a modest used step van, equipment, labor, kitchenware, a generator and a POS system. As popular and inexpensive as food trucks are, it still takes a lot of work to actually start one and be successful. 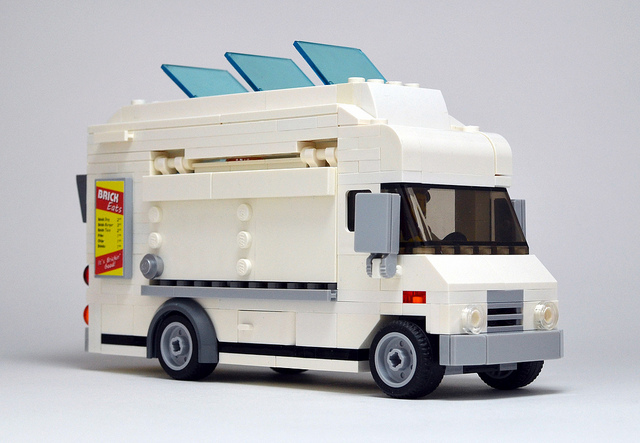 A food truck is still a business, and businesses require a lot of marketing to stay afloat. To really be successful in a food truck venture, you should first develop a unique brand. There are plenty of food trucks out there, and your truck should be unique if it’s going to stand out. This includes everything from a great menu to the design of your truck. Since your business will be mobile, you can also use social media such as Twitter and Facebook to let your customers know where you are in a given day. The second thing to remember with your food truck, is to know where to park. Many cities have restrictions on where to park, which can be problematic if you want to set up your business in certain areas. Know where you can park for free or with as few restrictions as possible, and see if you can include catering services to offset the problems with not parking where you always want. Try to operate in a few set locations as well; it will make it easier for your customers to find you. Finally, remember that your food truck is a restaurant and not a hobby. Pay attention to details such as portion control and costs of ingredients. You may have an unconventional restaurant, but you should treat it just like any brick-and-mortar establishment.